A trip to the middle east had been on our "to-do" list for many years, but we got the final impetus we needed in the spring of 2013 from one of Justin's co-workers, Steve. He had just returned from a trip to Egypt and Jordan, and told us he had a great time and that - because of the "Arab Spring" in 2011 - there were almost no crowds at any of the sites. We decided to make a go of it, and booked a small group trip to Egypt and Jordan, and then added on a couple days in Istanbul and 10 days in India, because we wanted to see tigers in the wild before they become extinct. We booked our trip in the spring of 2013. And then in June, there were mass demonstrations in Istanbul, with riot police, tear gas, several deaths. Then on the 4th of July 2013, the Egyptian army overthrew President Mohammed Morsi, and Egypt descended into chaos. This was not good for us, and much more importantly, not good for the people in Turkey and Egypt. We read everything diligently, although most of it was through the filter of the way it was reported from Western Media. We were told that our travel agent had cancelled all of the Egyptian tours through September 2013, but was hopeful that things would calm down. We sat around and waited, and waited, and things seemed to be getting a little better. Every now and then things would flare up again, but not as bad. In early 2014, we decided that unless our trip was cancelled, we planned to go, figuring that the tour agency has a vested interest in making sure nothing happens to its clients. Nearly everyone we told about our trip told us we were crazy, but we were cautiosly optimistic. But the usual enthusiasm that starts weeks before our trips wasn't there this time, because we never really knew it was going to happen. So when the days leading up to the trip were finally here, it was a bit surreal. Until noon today, this was a rather regular, boring Friday. Crystal was at the office, working, and Justin was at home with the pups, working (he was working, they were sleeping). Around noon, we each called it a day, got cleaned up, took care of final packing stuff (95% was already done), and then got on our way a little after 1pm. The drive up to LAX, while never enjoyable, wasn't too bad this time, with the exception of a jerk in a Prius (shocker!) who was intent on driving 55 in the carpool lane while everyone whizzed by at 75. The usually full bus to the airport from the Hilton where we parked was empty, just the two of us. 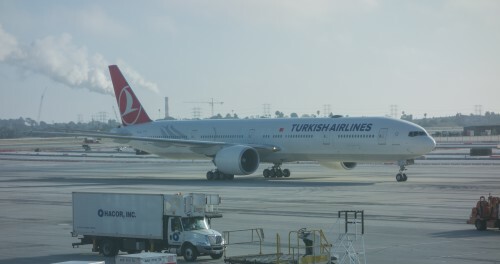 Before we drove up to LAX, we had seen that our 6:20 scheduled departure had been moved to 7:00pm, and since the plane coming in from Istanbul wasn't scheduled to land until after 5:00pm, we were dubious even about 7:00pm. So the check-in was fairly leisurely, even at 4:00pm. The only issue was the counter agent looking for something (and not finding it) in our passport. Justin asked if he could help her find something, and she said "Jordanian visa" to which we said "oh, it's on arrival." She had been flipping through our nearly full passports for about 45 seconds, so she took our word for it, saying "if anyone would know about Visas, it looks like you two." The security line was exceedingly short, only about 3-5 minutes. The International Terminal had changed substantially since we were last there in 2012 (in 2013 our first flight was to DC, so we left from a different terminal). 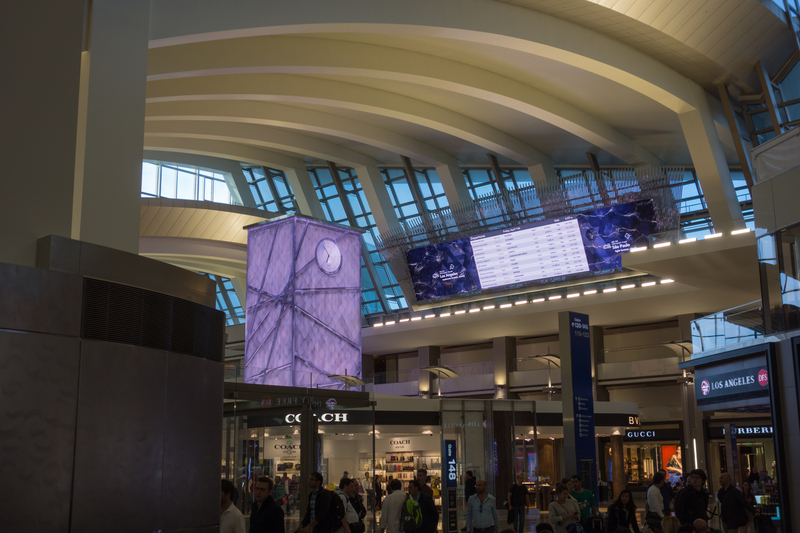 It actually looks like a real terminal now, and even somewhat resembles a nice airport. That's the good. The bad is that Pink's closed in the remodel. We have now forever failed to go there. We first saw it in 2009, when it was about to open. 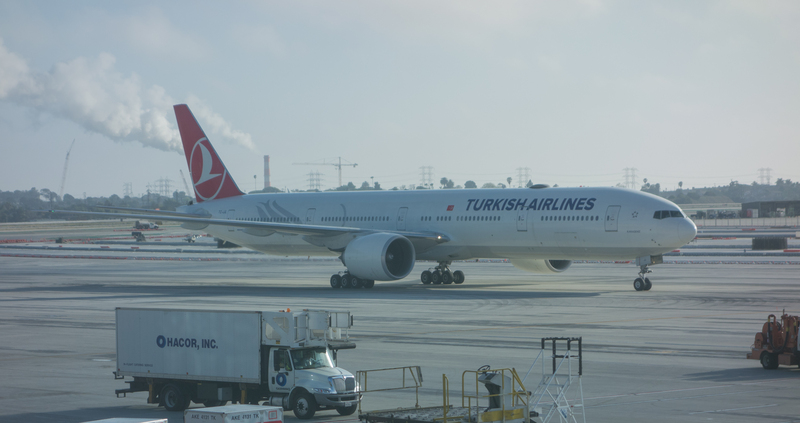 We vowed to go to it the next year, but that year, and every following year, we failed for a variety of reasons - got there too late in the night, flew out of a different terminal, construction, or something else. So the airport Pink's is our white whale. We ended up eating at Border Grill, which at least was quite good as a substitute. The plane didn't leave at 7, it was more like 7:30. The airplane configuration was 3-3-3, and we had a middle and an aisle in the middle part, with Justin sitting in the middle seat. This worked out well, because he took an Ambien and didn't need to worry about anyone ever needing to wake him to get out. But that didn't help make the seats any bigger - they were very tiny, with very little legroom. At one point Crystal realized that we needed to put the armrest down to recline the seats, that helped a fair amount. We were both out before the meal, but not soundly.